I’ve written that the average Magic player is too afraid of taking mulligans. That goes double for Modern, where card advantage matters less than in other formats, and triple for Colorless Eldrazi Stompy, which is built to mulligan aggressively into lean, powerful openers. Whether it’s because of my own results with the deck, the attention it’s gotten from other players, or the fact that it runs a set of Serum Powder, that deck has resonated impressively among the Moderners I interact with online and locally. My default encouragement to Colorless Eldrazi Stompy newcomers of “reps, reps, reps” sufficed for a while, but I think the time has come to publish some more specific playing theory. Today, we’ll take a close look at the deck’s most integral and challenging aspect: mulligans. I measure my openers on three metrics: free-win dimensions, curving possibilities, and effect variety. The one I value most varies by opener or opponent. As we explore these aspects in detail, it’s crucial to remember that the pressure on our openers to embody them lightens as we mulligan lower and lower. While this tip seems intuitive in writing, it’s easy to neglect during a match, and the ensuing hands can spell a loss. Freedom isn’t free, as I’ve heard in many a rousing song of late. And neither are “free wins,” hence the scare quotes. But they’re close—hence this section at all. Colorless Eldrazi Stompy boasts a few cards that will put it deeply ahead in certain matchups. Eldrazi Temple: A functional zero-mana Time Walk. Temple lets us play a turn ahead of our opponents and is our most universal free-win card. Chalice of the Void: Beats one-drop-centric decks (and zero-drop-centric ones post-board, like Affinity, Cheeri0s, and Living End). Also cuts out most pre-sideboard interaction from fair decks (Bolt; Push; Path) and greasing engines generally (Noble Hierarch; Serum Visions). Chalice provides more blowout victories than any of our other cards, especially in conjunction with Simian Spirit Guide. Eternal Scourge: Beats removal-heavy decks by letting us “go Dredge” with a recursive threat. Most fair opponents are forced to race us to defeat Scourge, a plan complicated by our manlands, fatties, and removal. Exiling Scourge to Serum Powder means we begin the game with it for free, which makes finding the bugger quite easy and greatly reduces pressure on our subsequent mulligans. Free-win cards also allow us to mulligan down to four or even three. A hand of four single-tap lands isn’t likely to beat anyone, for instance; I would ship that in a heartbeat. There’s still a chance our three yields two Temples and a Thought-Knot Seer; or land, Guide, and Chalice; or two lands and Eternal Scourge. And there’s a chance those cards beat our opponents single-handedly. Colorless Eldrazi Stompy goes to great lengths to ensure graceful curves occur frequently, and in spite of aggressive mulligans. Hands with full-mana plays on the first, second, and third turns of the game should always be kept. These hands involve either Eldrazi Temple and Mimic/Endless One; Gemstone Caverns/Simian Spirit Guide with Chalice/Mimic or Temple and three-drops; or Dismember and Chalice/Mimic. A 1/1 Endless One is not an acceptable turn-one play, and neither is using Guide to accelerate into anything besides Chalice or a three-drop. But everything else goes. Endless One is particularly useful for plugging holes in clunky curves by costing what we need it to for a decent return on our investment. Given Modern’s tempo-centric nature, its fair decks are all about curving. The primary reason for Eldrazi’s sustained success here is the archetype’s increased ability to curve out admirably thanks to its namesake land. Thanks also to the efficiency of our threats and interaction, curving out properly in Colorless Eldrazi Stompy regularly paves a path to victory. In other words, variety. Some openers are keepable by virtue of their heterogeneity. Look specifically for diverse forms of interaction when sitting down to a match in the dark. Know the value of your cards in different matchups. Eldrazi Mimic and Thought-Knot Seer shine against noninteractive decks of all flavors; Matter Reshaper and Eternal Scourge hassle removal-heavy decks; Smuggler’s Copter and Blinkmoth Nexus fly over board stalls; Chalice of the Void hoses aggro-combo and low-curve decks generally; Dismember ensures you don’t fold to Baral, Chief of Compliance or Blighted Agent; Ghost Quarter provides some insurance for big mana. Hands featuring multiple avenues of coverage can excuse a truant Eldrazi Temple so long as they curve well, or a wonky curve so long as they contain a free-win dimension. This hand free-wins against one-drop decks and removal with Chalice and Scourge, respectively; pressures big mana with Mimic and Quarter; and keeps pesky one-drops off the table. Mimic puts opponents on the back foot, and therefore combines with Chalice to buy us the time needed to make some land drops. The hand lacks Eldrazi Temple and a built-in way to cast even Eternal Scourge, and we’re likely to lose a mana to our awkward curve if we cast Dismember. But I’d keep this seven blind because it interacts efficiently with many possible opponents. So we know what to look for. But what should we look to avoid? Of course there’s a lot of overlap here, so I’ll keep this section brief. Lands and three-drops? Yawn. One threat and some removal? No thanks! We’ve got four Serum Powders in the deck, so our mulligans tend to be pretty great. Any six- or seven-card hand that doesn’t wow us should be mulliganed, regardless of how many Powders we’ve got left—if we’ve used some, that’s a bunch of non-Temple cards out of the deck already; if not, we’re likelier to hit them and dig into those Temples. In the dark and on the play, the only seven-card one-landers I’d keep with this deck have Eldrazi Temple and a turn one Chalice. 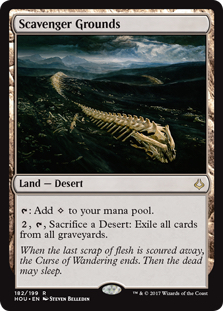 On six, I’d also keep one land with Temple and Eldrazi Mimic, as long as it also has three-drops or Dismember. Sevens with only Temple and no turn-one Chalice are excusable only on the draw, and only if they feature Mimic, Thought-Knot Seer, and Simian Spirit Guide. The purpose of these examples: to illustrate how crucial it is to act during Modern games. This deck does not ever want to durdle pre-board. Hands that don’t feature more than a couple plays before any draw steps occur ride up the sliding scale of playability depending on the potency of their free-win dimensions. For instance, a six of two Guides, Scourge, Temple, Thought-Knot, and Chalice assures a fine mid-game should land arrive in a turn or two; replace Reshaper with a third Guide, and it now has Chalice into Thought-Knot built-in at the cost of robustness—no way does this new hand beat Terminate, but no way does it lose to Grixis Shadow, either. The first hand could go either way. Since different cards provide free wins against different decks, accurate metagame prediction helps settle on these risky hands. Taking this idea a step further, deducing with some precision which decks are likelier to stay live deeper into a tournament may change how you interact with the same opener over multiple rounds. Serum Powder is the single best card we can see in our opener. A good hand with Powder is a good hand—even if it has Powder! And a bad hand with Powder is a free shot at a good hand. Considering the requirements we have of our openers, milking those re-rolls makes an enormous difference over the course of an event. As an example of how not to use Serum Powder, take the first game of Corbin Hosler’s Mining Modern feature on the deck. The first 20 seconds see him Powder away an easy keep and then keep an easy mull; that first hand contained two free-win dimensions and a reasonable curve in spite of two dead Powders, while the second had only Scourge and was way too slow for comfort. In this section, we’ll take a look at why those decisions are wrong. Eldrazi Temple is the reason we play Serum Powder. The artifact’s primary goal is to find this land. Since the Eye of Ugin ban, each of Modern’s Eldrazi decks has featured a non-Temple way to cheat on mana: Bant employs Noble Hierarch; Taxes uses Aether Vial; Tron has, well, Tron. And colorless Eldrazi Stompy has Serum Powder, a card that helps us aggressively mulligan into our sol land. Almost every hand with Serum Powder that lacks Eldrazi Temple should be Powdered. The only exception: hands with turn-one Chalice and a good curve or effect variety (i.e. Chalice, Guide, Quarter, Mutavault, Dismember, Mimic, Powder). Back to that good hand with Powder. How “good” should it be? After all, we certainly don’t want to keep a lackluster hand with Powder. And having Powder in a keepable hand instead of pretty much any other card does dumb it down. I follow a simple rule to analyze Powder-featuring openers: pretend there is no Powder. You know, like that kid in The Matrix. If a seven-card hand with one Powder is a passable six-card hand without it, keep the hand. The same goes for six- and five-card hands. This rule does a 180 for hands of four or smaller—we’re likely to Powder these away no matter what, as most fours are significantly better than three and so on. Things change a little for hands featuring two Powders. These hands put extra pressure on the remaining cards. Take Corbin’s opener of two Powders, Chalice, Smasher, Thought-Knot, Temple, and Quarter, which minus the Powders becomes a five of Chalice, Smasher, Thought-Knot, Temple, Quarter. This five isn’t just keepable, it’s better than most sixes; besides, Powdering it away means one less Eldrazi Temple in the deck, and so overall worse openers down the road. So I like keeping. But replace Thought-Knot or Chalice with a second Smasher, and the hand gets significantly worse; I would indeed Powder it away in that case. Notably, it’s never correct to mulligan a hand with Serum Powder. Even one with three Eldrazi Temples. That hand is either a keep (on, say, four cards) or a Powder (on 5+ if it has no real business). As a rule of thumb, don’t worry about losing certain cards in the deck to Powder; just focus on finding competent openers. Eldrazi Temple is the only completely non-interchangable card in the deck, so this rule applies just partially to that land; factor into your decision that your next opener is somewhat less likely to feature it. Every hand with Powder and Scourge that lacks Eldrazi Temple should be Powdered. That extends to hands with Guide and Chalice, and only changes in a post-board scenario. Since Temple and Scourge together provide two free win dimensions, we tend to keep hands with both, even if they have Powder. Having just Temple as a land and having just Scourge as a non-mana card are the only two reasons to Powder them away. On the draw, Gemstone Caverns also interacts with Serum Powder. Taking a new hand here can seem appealing since Caverns is legendary, so it’s nice to get extra copies out of the deck. But it’s also nice to start the game on the play, which Caverns allows and is here for in the first place. Since we can exile the useless Powder to Caverns, we usually keep these hands. Things change if we open more than one dead card; say, two Gemstone Caverns or Serum Powders, or an Eternal Scourge. Now, we have multiple cards to exile for Gemstone. In these cases, we often just Powder. Even if that’s its primary goal, Powder doesn’t just offer us extra mulligans. The card does have some in-game uses. Ramping. Okay, here’s the obvious one. In lieu of a Temple, turn three Powder lets us cast turn four Reality Smasher. And on four lands and a Temple, we can cast Powder and then play a three-drop. This play might not seem like much, but dumping our hand onto the table in the form of extra mana plays nicely with our utility lands, specifically Sea Gate Wreckage. Tapping for colorless. Blood Moon is a great speed-bump for Eldrazi Tron and stops land-combo decks like Valakut and Amulet in their tracks. So it’s no wonder the decks that can pack it—well, mostly Storm—do so. But the card is hilariously bad against an Eldrazi deck with four Serum Powders to back up a set of Quarters and two Wastes. The extra mana source (bringing our mainboard count to 31) also doesn’t hurt against Fulminator Mage and Stone Rain, both of which can handily mana-screw other Eldrazi decks. Doing artifact things. Artifact things? Artifact things. Like baiting Abrade so we can stick Ratchet Bomb. Or discarding to Wrench Mind to save us from Shrieking Affliction. These cases may be rare, but they do come up. There you have it—a crash course on mulliganing with Colorless Eldrazi Stompy. Join me soon for a comprehensive guide to sideboarding with the deck, and you’ll be well on your way to dominating your local game store and getting kicked from “competitive” online Modern rooms! Read Part 2 of this article series, “Colorless Eldrazi Stompy Mini-Primer: Sideboarding,” here. Glad you liked it! Rest assured there’s more in-depth CES content on the way. I went 7-2 day one and then got dumpstered on day two, before dropping after round 13. I’ll write up a tournament report on the mtg salvation primer thread, but I wanted to let you know that this deck performed very well. I was chosen for a feature match round 5 and won that handily. As it’s apparent now, Scapeshift and Big Tron dominated the field, which just happened to be the decks I lost against. Oh, and it turns out that we have zero game against Bant Eldrazi (final loss round 12). Other than a few tweaks to the sideboard and maybe +1 Dismember/-1 Ratchet Bomb main, the deck felt great. Thanks for your continued dedication to this archetype and really insightful content. Yeah Bant is very difficult, harder even than Valakut decks IMO. Congrats on the finish, and looking forward to your report! Any thoughts or testing on Semblance Anvil in Eldrazi Stompy? I tried it out for about a week in testing, and came to the conclusion that it’s just not fast enough. It’s insane if you hit the absolute nut draw, but is just too slow. If you don’t get it down immediately then it becomes the worst topdeck you could imagine.